Being my first time in the country, I didn't know what to expect when I touched down at Yangon International Airport (except I knew that I had to change Burmese kyats at the airport since it was not available at Changi International Airport - tip for those who are making their way to Myanmar.) I wanted to find out more about the interesting, relatively new but robust ICT market in Myanmar, by attending CommuniCast and speaking to some key stakeholders in the telecommunications market about the potential of the enterprise IoT market. Lots of articles talk about the potential 'leapfrog' of Myanmar with regards to technology adoption. With connectivity and devices at exorbitant prices until a few years ago, enterprises and government organisations still relied heavily on paper and pen for their administrative work. Recently, with the entries of new telcos in the market, connectivity has become much more accessible, allowing these organisations to explore new options and enable more efficient and productive ways of managing data. The lack of legacy devices provides an interesting opportunity for these organisations to 'leapfrog' into technologies like Cloud and Big Data, without the usual-seen hassles of converting and maintaining compatibility with previous systems. Despite the great potential for enterprise ICT adoption in Myanmar to grow, there are many fundamental hurdles that the enterprises and solution providers face. Telecommunications infrastructure is still being developed - MPT, the country's largest telco network, covers more than 90% of the population. There are still frequent power cuts due to depreciating power lines and surge in demands, even in Yangon - the biggest city and commercial centre - making it more risky for businesses to rely on technologies for their day-to-day operations. 4G is just starting to roll out and broadband/fiber connectivity prices still remain high, resulting in the penetration rate of less than 1% and the proliferation of satellite connectivity, especially in more remote areas. Another challenge that ICT adoption in enterprises in Myanmar faces is the cost. 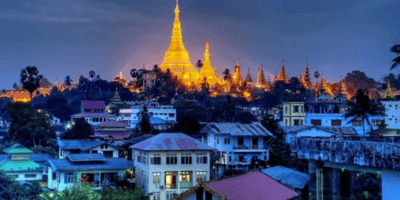 While number of enterprises in Myanmar has grown tremendously over the past few years as a result of economic liberation, most enterprises remain at a small and medium size. This means that capital investment in technologies - most of which come from international solution providers - can be expensive. The government is also considered to be lagging behind in terms of digitisation initiatives, thus enterprise digitisation usually turns to foreign investments (e.g. Myanmar Beer) or is limited to the bigger firms with capital to invest (such as banking). On the other hand, the lack of legacy systems and experience with technologies have led to a lower level of tech-savviness in the population, compared to its neighbouring countries. This means that educational efforts need to be made in order for the enterprises to be more familiar and ready before integrating technologies into their workplace. Enterprise technology adoption in Myanmar is definitely growing. As the economy continues to open up, connectivity and electricity become more stable, awareness on technologies' benefits and how to use them increases, the relatively open market provides much opportunity for solution providers to not only access the market, but also provide guidance for the local enterprises wishing to learn and adopt new technologies in the near future. 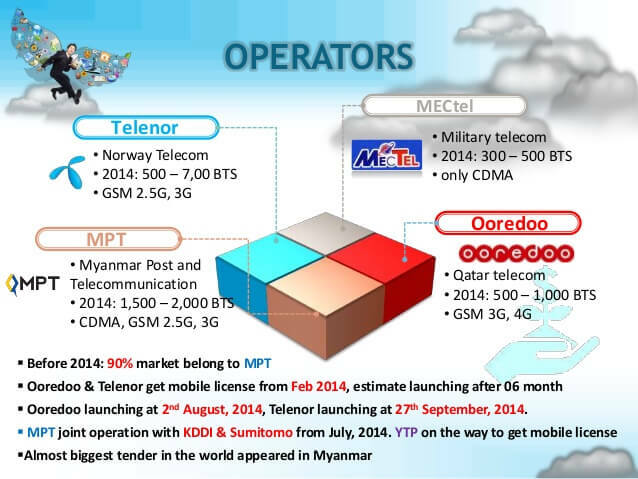 Telcos have an advantageous position in the current Myanmar ICT/IoT market. They already have a strong brand recognition among both consumers and enterprises, and local enterprises prefer one-stop solution providers with local presence, making existing telcos the ideal partner for accessing the enterprise market. Local organisations such as Myanmar Computer Federation and Phandeeyar are also helping to grow the IT workforce and helping the relevant government agencies understand new technologies such as IoT and Smart City. This will potentially help the policy-making process faster as the government looks to support the local ICT growth and developments. What do you think 2017 holds for Myanmar's ICT/IoT developments? Comment below. Drop me a message (here or at dinh@industry-platform.com) if you'd like to learn more and/or discuss about ICT/IoT developments in Myanmar.